We are pleased to present a selection of sessions on themes of international concern and connections at Split This Rock Poetry Festival 2016: Poems of Provocation & Witness. 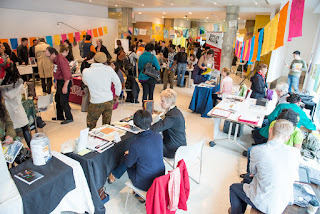 In the winter and early spring of 2016, Washington, DC was home to Al-Mutanabbi Street Starts Here DC 2016, a unique book arts and cultural festival standing in solidarity with the people of Iraq and standing for free expression. Exhibits, programs, and events commemorated the 2007 bombing of Baghdad’s historic bookselling street. Split This Rock curated extensive literary programming, bringing 10 poets and translators from Arab America and the Arab and Muslim worlds to the DC area for readings, translation workshops, and public conversations about the impact of the US invasions in the region and the role that literature can play in building bridges and building justice. 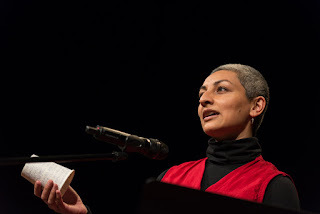 Organizers Browning and Frederick will be joined by Amal al-Jubouri, featured poet at both Split This Rock and Al-Mutanabbi Street Starts Here DC 2016 and founder of Arab Human Rights Academy, who splits her time between Baghdad and London.are pleased to present a selection of sessions on themes of international concern and connections at Split This Rock Poetry Festival 2016: Poems of Provocation & Witness. Queerness and Latinidad both offer spaces to explore the complex, messy, and undefined parts of LGBTQ Latino/a poets. To combine both is to honor the queerness in Latinidad, and the Latinidad in queerness. Five Latina/o poets explore the diversity of Queer Latinidad, representations of marginalized communities such as Afro-Latino and Central American, and queer issues of racism and class. A question and answer session will follow the poetry reading, in order to engage with the audience on the rich complexities and nuances of Queer and/or Latino/a identity in 21st century poetry and poetics. "I am broken by the revolt exploding inside me." – Namdeo Dhasal, poet and founder of the Dalit Panthers. In this powerful and engaging workshop, poets of The (Great) Indian Poetry Collective draw poetic inspiration from activist art from various waves of political movements in India and the diaspora. Using prompts drawn from a variety of poets who have been engaged in activist movements, participants will write deeply into issues of exile, imperialism, identity, caste/color discrimination, sexuality, and more. We'll explore how verse turns the deeply personal detail into the universal, bringing to light little-known voices from India’s radical political traditions and injecting new energy into American poets wishing to engage with global revolutions. We’ll share all the materials so that participants can take them back and share with their own communities and/or students, diversifying their reading lists to include vibrant contemporary global voices of protest. This reading and conversation features 10 poets from the capital City of Tshwane, South Africa, who were all Finalists in the Speak Out Loud Poetry Competition at the South African State Theatre. As part of a Sister Cities International Agreement, Split This Rock has been working with the City of Tshwane to organize an on-going arts and culture exchange program between Washington, DC and Tshwane, South Africa. Split This Rock is pleased to present our young sister and brother poet-activists of the New South Africa. This roundtable includes poets and translators of Middle Eastern poetry, focusing on Palestine, Iraq, and US military worlds, and the everyday experience and poetics of the spaces between war and peace, resistance and occupation. The group will present examples of Middle Eastern poetry in its relationship(s) to activism, resistance, and social justice in everyday spaces governed by war, occupation, and post-war considerations. 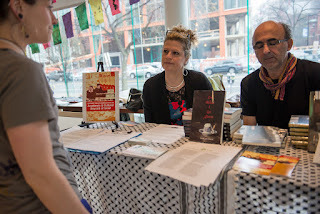 It will provide attendees with background and discussion space to consider concepts of local and everyday resistance in the Middle East and its poetry. Translators speak for those who cannot express themselves in a given language. For practical reasons, previous generations of translators tended to work with politically powerful, wealthy, and literate elites in source language communities. Thanks to the digital revolution, however, translators can now easily access communities beyond those elites; they also now possess the means to publish and disseminate translated work, including materials subject to censorship in the source language community. What is the proper role of the translator in the digital universe? What are our responsibilities to ourselves, to those we translate, and to the larger communities seeking to transmit and receive information across language, social, and political barriers? Translators also increasingly serve as de facto online publishers and gatekeepers: what ethical questions should we consider in making translated materials public? The presenters – all of whom have translated materials that speak for politically oppressed peoples – will offer three specific, diverse models (activist, curator, and cultural interpreter) as a basis for thinking about the ethics of what translators do. This conversation is ongoing in the translation community: the presenters are actively seeking participant input to help better define an ethical translation practice in the digital world. This reading will include materials from three generations, using the word to document the Hmong people's struggle for freedom across countries and continents. Readings will be from original letters by the only Hmong man who recorded in writing the struggle for his people's freedom, which was tied to the greater struggle for democracy in Indochina; a memoir by his son; and poems by his granddaughter.